Take the guesswork out of gift giving! 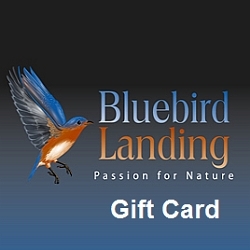 Give a Bluebird Landing Gift Card—it’s an easy and fun way to let the bird and nature lovers on your list choose their own perfect gift. Shop on our website and your recipients will find thousands of top quality wild bird products, home and garden accents, nature gifts, plus so much more to enhance their passion for nature! We offer Gift Cards in the amounts of $25.00, $50.00, $75.00, $100.00 up to $300.00. When purchased your recipient will receive an email with your own personalized message and details about how to redeem. Gift Cards are non-taxable and there are no shipping charges applied when purchased.